Thursday afternoon Highland High School football players were introduced to the classes who adopted them. 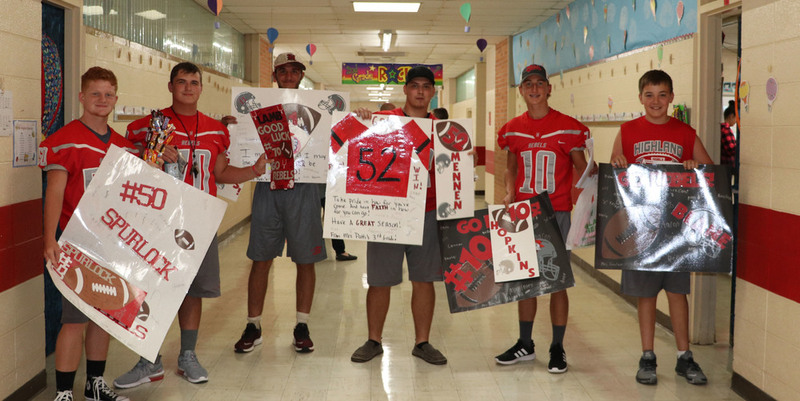 Many classes made posters, signs, or cards showing support for their player. Several players passed out suckers or candy they had purchased for their class. Coach Carter said, "I tell these young men they are role models, but today they saw it. We are trying to create good football players, but we are also trying to create good young men. I think making these connections will help." Carter said the players plan to visit the classes again during the season. This is the first year the classes have adopted a player since Carter has been a coach, but he hopes it continues in the future. The adoption was created by Misti Carter who is a teacher at the high school and a parent of a football player. Misti Carter said, "I saw it as an opportunity to teach all students the responsibility of belonging to a community and the importance of their role in that community. I believe it’s going to help build school spirit and school pride. The elementary faculty and the football coaches and players took the idea and ran with it - they’ve done all the work!"